Imagine yourself in a very big and open room. To your right you have a couple of aisles with some wooden doors that lead to meeting rooms. Most likely you don’t have access to those. There are some escalators to go to the second floor and find some other rooms. Behind you, the glass entrance door, with some cold air filtrations (not the most energy efficient). To your left you have a welcoming booth, where you got you backpack and water bottle. There are also some spaces for media. 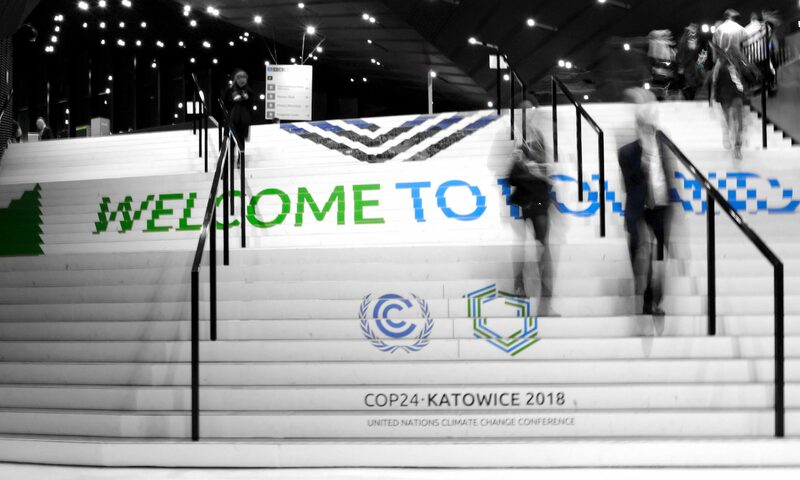 Straight of you, you see that image, the one you might have already seen in pictures, an image of white stairs with the COP24 logo and a bunch of attendees (including me a little bit later) getting their picture for the history. 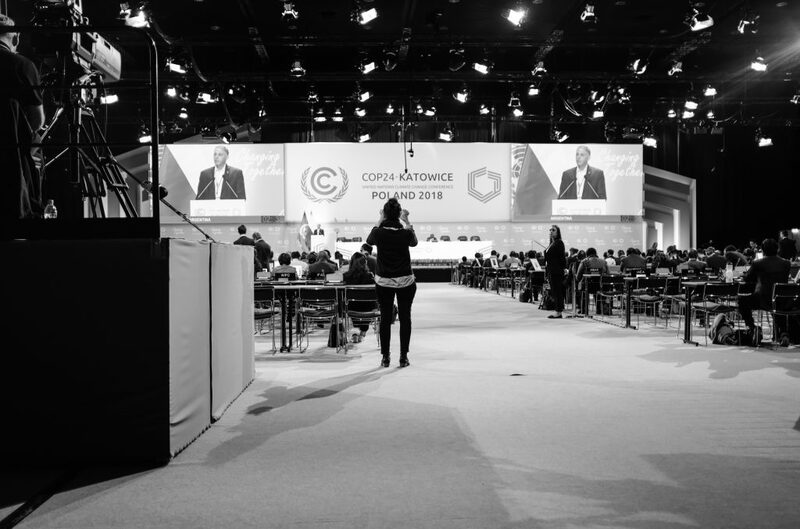 This is COP24 main hall. Everywhere you see, there are people – people everywhere.People everywhere, and from everywhere. The diversity you see at this place is noticeable. Languages you might have never heard first handed. It colors the room and fills it with new air. From the far everything looks convoluted. Once closer examined, things appear more common. With each of my steps, this place became less of a news article an more of a personal experience. 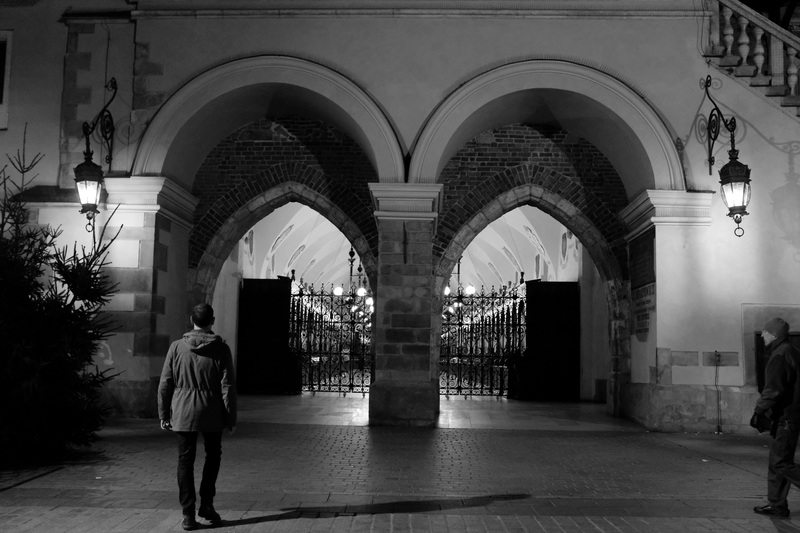 This is my experience during this COP, in Katowice, Poland – Europe’s coal capital (by far). And trust me, this is not the “clean coal”. 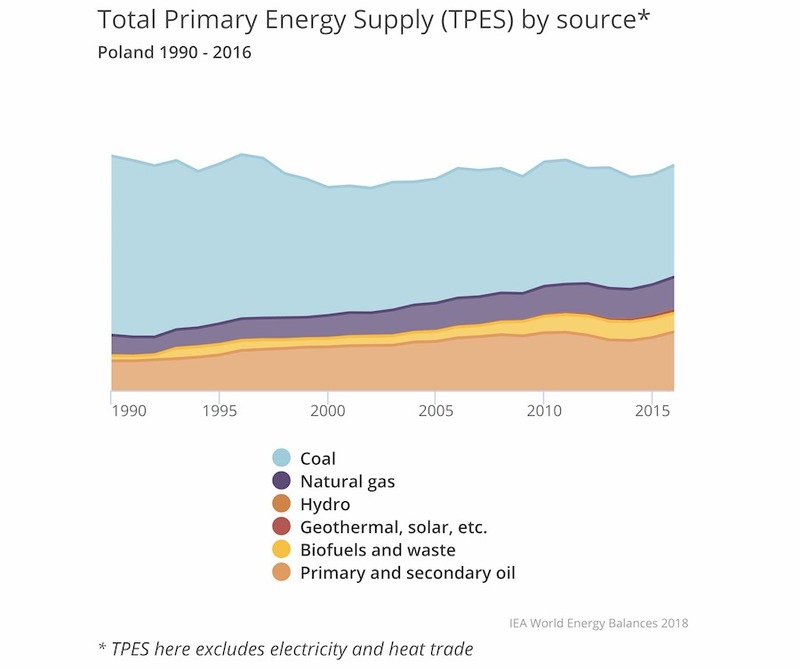 In Poland, 80% of energy comes from coal, the most polluting source in environmental terms, and the most harming one for human health. The country is home to 33 of the 50 most polluted cities in the European Union. Approximately 100,000 people worked in the mining industry in Poland as of 2015. After reading these numbers it is not hard to understand why the greatest commitment the country had made was to decrease to 60% the TPES coming from coal. You can read more here. 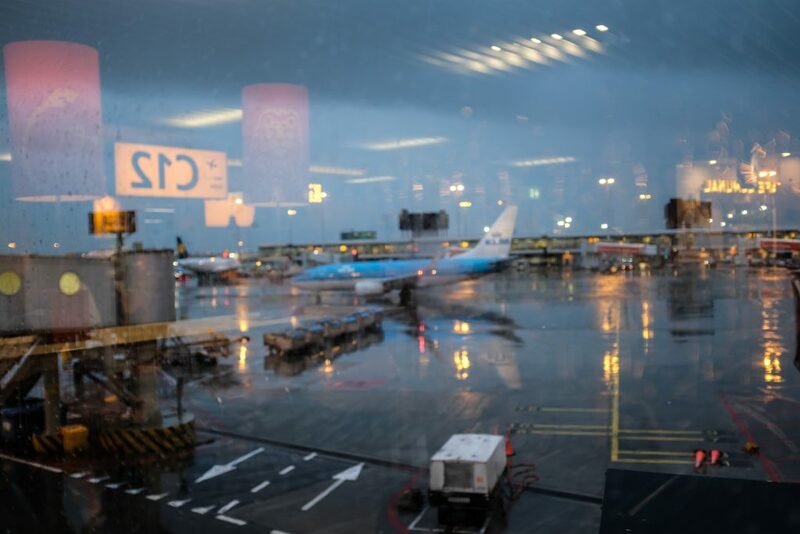 Getting to Katowice was an Odyssey (courtesy of Delta and KLM). But, after 63,692.6 kg of aircraft fuel burnt, and 560.8 kg of CO2 (per person) emitted, we made it to Kraków. (You can calculate your emissions from flying in ICAO’s website). 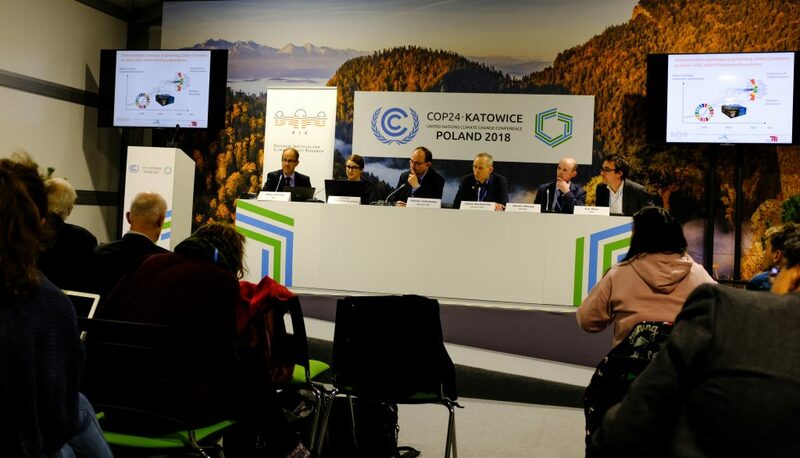 The first day at COP24 left we with a bizarre sensation. On the one hand, seeing so many people with the interest of changing the way we are living, is empowering. On the other one though, doing so in the same way that we are trying to change could seem a little bit contradictory. Just the thought of the amount of coal burnt to keep these unsealed venues warm during a snowy day is enough to paint the picture. Or the pine logs at one country’s pavilion that were put to represent the forest, when they needed to clear a tiny patch of this forest in order to create this fake impression. But that’s part of life. The amount of things happening simultaneously is enormous, so massive it seemed that there are different conferences within this one conference. Whichever issue you are interested in, you would find that you have to make decisions as for where to go every single hour. 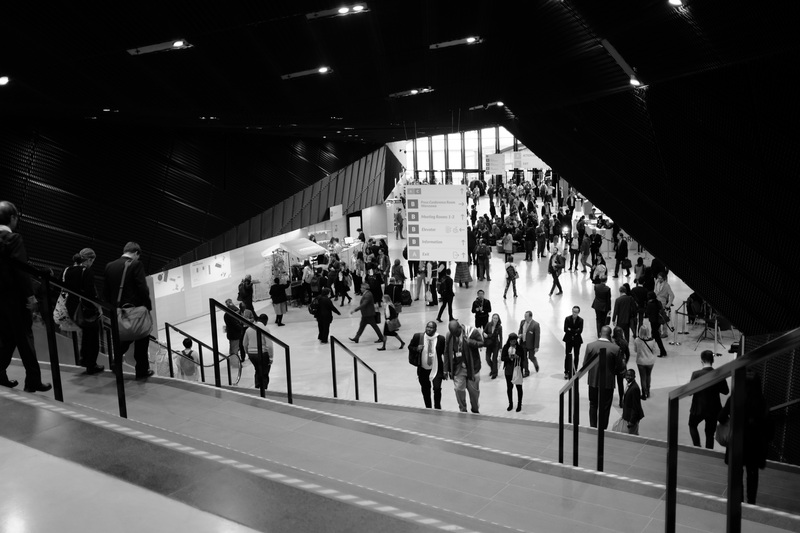 Between side evens, meetings, country’s pavilions, NGO talks, and just chatting with people… The schedule is tight, and no matter how badly you want to sleep, you forget about it as soon as you walk up those stairs. My main interest is in energy transitions, since we cannot even think of a future if we do not stop putting gases into the atmosphere, and energy is a key piece in this puzzle. Thus, energy I followed. 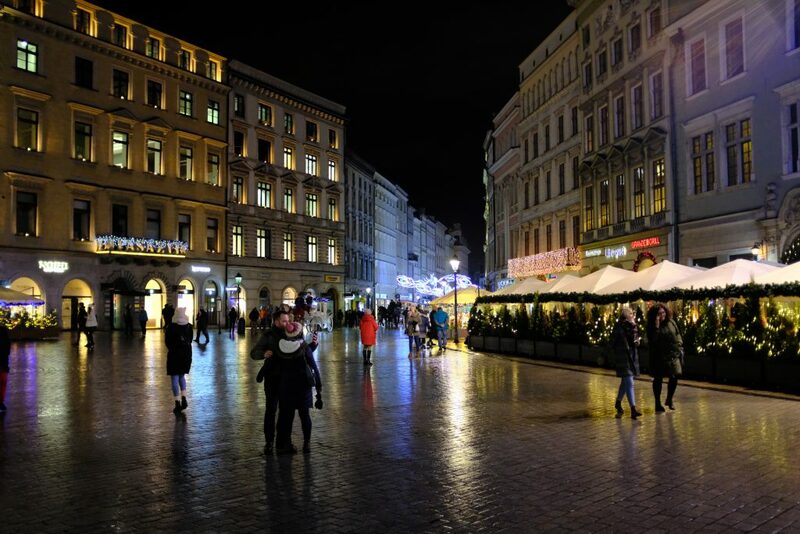 Beautiful (most likely coal-powered) lights in Kraków. The conclusions from the talks on Monday are clear: we need to decarbonize our economies. No one will turn off the switch and pause their economic development, which is absolutely the correct thing to do. However, we cannot continue to use the same switch for ever and ever. We need to transition to clean energies (and for the sadness of some, this does not include natural gas). 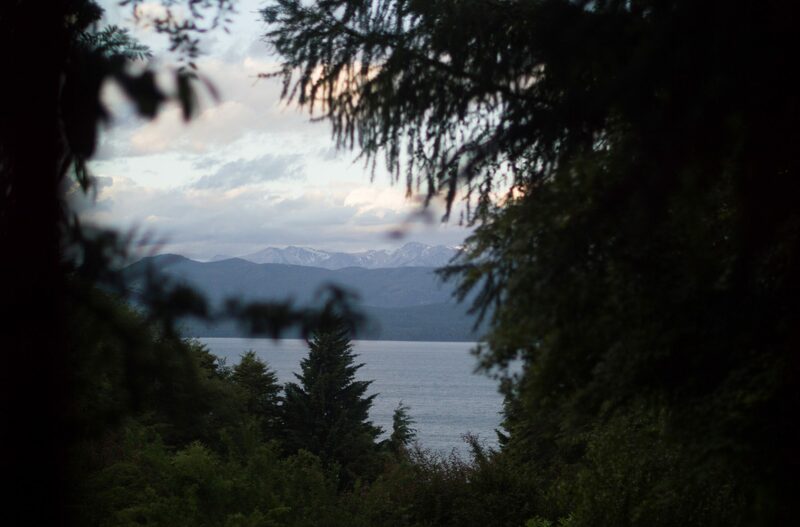 New Zealand, and its soul mate Costa Rica, are heading in this direction. You can read more about these two countries in this post. One way to help this transition is by putting a price to carbon emissions, and using its revenues either for research and development on new technologies, or to give the revenues directly to the public. You can guess which is the most popular option. You can read about examples of carbon pricing here, and about some examples here. There is no consensus on what this price should be, but it is common knowledge that we consume less of a product as it becomes more and more expensive. Basic demand and supply laws (thanks economists). Communicating this price on carbon is key for it success. For example, it is better to talk about “putting a price on carbon” instead of “carbon tax” since people do not like taxes (obvious fact). One should be very clear regarding where the revenues will go. Also, identifying your opponents will be important. For example, in Washington state, BP spent $13 million to defeat a a carbon tax of $40 per ton of CO2. You can read everything about how to better communicate carbon pricing in this guide. The first talked I attended, about energy transitions towards decarbonization, had an all women panel, which has to be a sign of progress. The public seemed engaged, with the exception of the girl next to me who spent all the talk at Instagram. Priorities I guess. One of the talks I attended started 30 minutes late. Morale of the story: things are not always as organized as they seem. A panelist from one of the talks seemed to be more interested at taking pictures of his public than at listening to his panel partners. Quite an awkward moment. 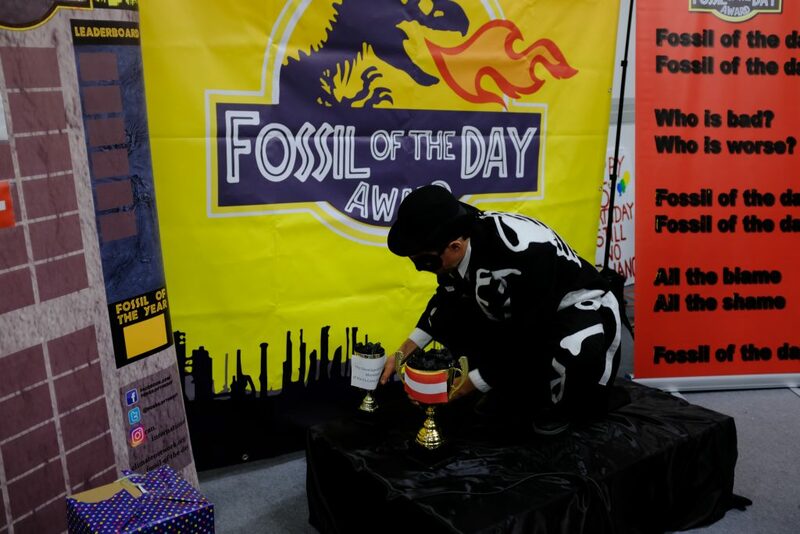 Fossil of the day award for coal producers. Getting food was so hard, I ended up eating lunch at 5 pm – and sitting space is so limited, I ended up having lunch with a stranger. Being an incredible researcher does not make you a good speaker. Finding power stations became a challenge – maybe they are saving energy after all. I saw some of the worst, some good, combined with the best panel I have seen (although I have to admit that I am pretty new in this conference world). Below are some reflections from this day, when fatigue began to appear. Let’s start with the good: the EU energy day – democracy and energy transitions. There were a lot of different talks about “just transitions” – about this idea that phasing out fossil fuels cannot mean leaving people behind. Prices need to remain relatively cheap for everyone to be able to afford electricity, heating and transportation. But at the same time this access cannot mean the depletion of the environment. 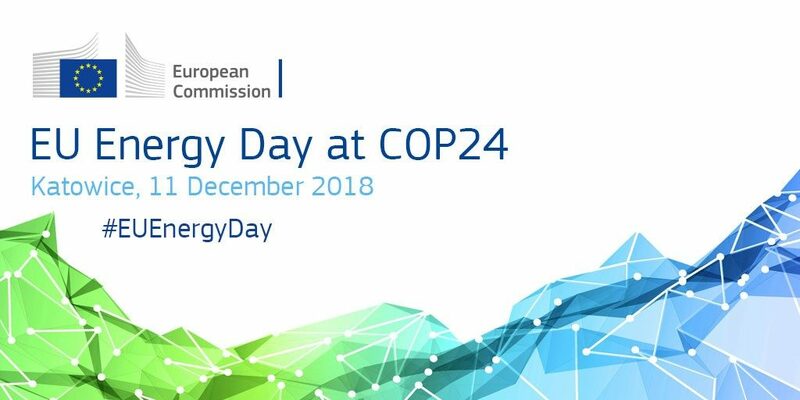 The EU day introduced the linkage between energy transitions and democracy, which directly leads to the concept of “cooperatives”. A cooperative highlights the notion of membership: the consumer is the producer, and is therefore linked directly to the source of energy. It is as simple as meeting with some people, agreeing to buy solar panels, installing them, and producing energy. This energy that you are producing on yur roof will be used at your home, and the excess can be sold to other people. Owning your own energy production not only raises people’s awareness, but it actually leads to less consumption. So what are cooperatives? Cooperatives are forms of organizations where one service is owned by several people. In a cooperative, the users are the providers. Cooperative: n. an enterprise or organization owned by and operated for the benefit of those using its services. 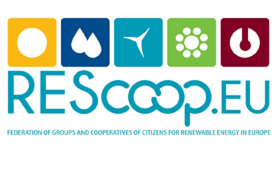 The European Union launched its REScoop 2020 project, with the goal of achieving renewable energy cooperation, of changing the legislative framework to incentivize co-power, and of increasing finance in renewable energies. If people group together in order to get renewable energies, the prices reduce dramatically, and there is a chance that they not only produce their own energy, but also sell some back to the grid. 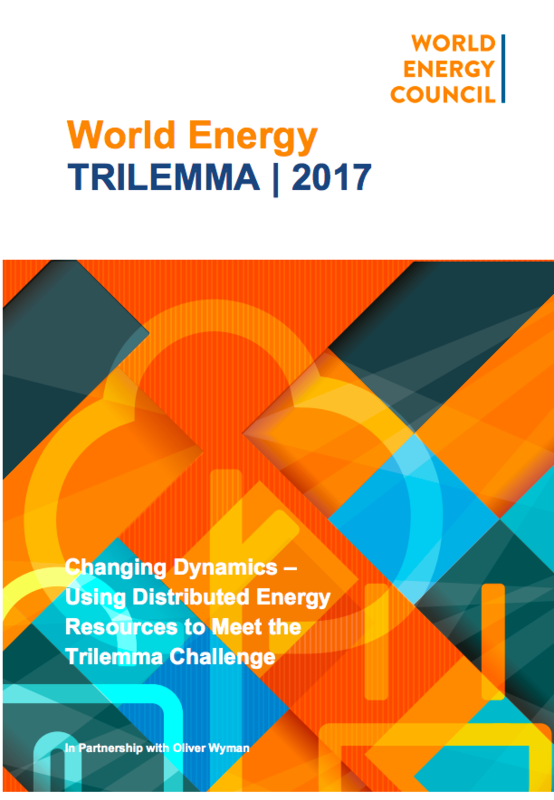 Decentralization of the grid improves democracy, and therefore the transition from fossil fuels to renewable energy can be just. The Greek Island of Sifnos is heading in that direction: achieving energy independence, and 100% renewable. My greatest question, and the one I had the chance to ask, was how do you go from a monopolized utility model (quite common in this industry) to one where people own their own energy. Clearly, there are some (and not only some) laws that need to be passed. You can listen to the answer below. Reply from Paula Abreu Marques, Head of unit ‘Renewables and CCS policy’, Directorate-General for Energy, European Commission, followed by Dirk Vansintjan, President of the European Association of renewable energy cooperatives. Now let’s turn to the best: planetary boundaries. Stratospheric ozone depletion – remember that big hole we had made over Antartica? Well, it is related to this. You can read about it here. Chemical pollution and the release of novel entities: have you heard of Silent Spring, a book written by Rachel Carson? It relates to this. Technically: too much pollution from pesticides and herbicides would lead to a spring with no birds. Climate change: the award-winning topic which you hear very often. Here, it is only one of nine crucial issues. Ocean acidification: if you have hear about coral bleaching, you know what this is about. You can read about it in this post. Freshwater consumption and the global hydrological cycle: what is the first thing astronauts look for in space? Water. This has to be a key indicator of how relevant this is. Land system change: have you every wondered where your food comes from? Well, that question strongly relates to this system. Nitrogen and phosphorous flows to the biosphere and oceans: in other words, fertilizers. We use more of them, and we alter the composition of different ecosystems, leading to algae blooms and dead zones. Atmospheric aerosol loading: those tinny particles that are thrown to the atmosphere. They can come from volcano eruptions, or from coal plants (although not only these two, of course). Each system has a boundary, and since the boundary is in our planet, we call them planetary boundaries. A boundary is a threshold, a limit, a gate with a “no trespassing” sign that we should not cross. However, we have already crossed some of them, and that explains the environmental crisis we are facing right now. There is no country in the planet that has managed to have high scores in social indicators while at the same time stay within the planetary boundaries. In other words, development is directly related to the planet’s destruction. Not good. We are at risk to overuse the global commons, while at the same time underinvest in social commons. This is, we are using more materials from the planet, while this is not improving our standard of living. True, we live much better than in the past. But do we all do so? What happens if we pay attention to inequality indices? Sustainable development needs to be re-conceptualized, and policy should be oriented immediately to decarbonizing our economies. Of course, easier said than done. Nonetheless, it has to be done. We need to rethink the way in which we use the resources from our planet. Technology will help us indeed, but not at the rate we need it. The IPCC 1.5 degrees celsius report has put it simply: 12 years left for change, before it is too late. This is serious. There are different ways to achieve this, but the most crucial one is decarbonizing our economies. A cooperative approach seems to be useful. The talk on Planetary Boundaries was incredible. I was stopped by the Polish police for taking a picture of the building where the conference was taking place. Such a threat. I am more and more tired everyday. I cannot imagine the people who have been here since day 1 (December 3), and who have been so engaged with (most likely deadlock) negotiations. A lot of panels today, and I finally met some interesting people. Not because I had not heard interesting people before. I had seen good panels, but approaching panelists cab be quite a journey. At the end of a good panel you have people, like me, running to the front to talk to the panelists. Usually, panelists are running from one place to the next (and away from you) and there is no time to talk. If you are lucky, you would intercept one or two. Minutes later the conference’s staff would “invite you outside” so that the next panel could begin. This paints the picture. The IPCC report on 1.5°C urges us to apply the so called carbon law. We need to reduce our emissions by half every decade in order to keep the warming of the planet below 1.5°C comparing to pre-industrial times (we are already 1°C warmer). Emissions seemed to plateau in the world in 2016, but they rose in 2017 1.6% and they are expected to raise more this year. This is not good. Increasing is the antonym of decreasing. If we consider that around 80% of emissions come from energy generation (be it in the form of electricity, heat or transportation), the way in which we produce this energy is crucial. And again, renewables make it to the picture. (Sorry for being so repetitive – but renewables are key). We need renewables. We need a transition. We need to decarbonize our systems. And we need it now. Islands, who are at the front of climate change, are also leading with renewable energy commitments. 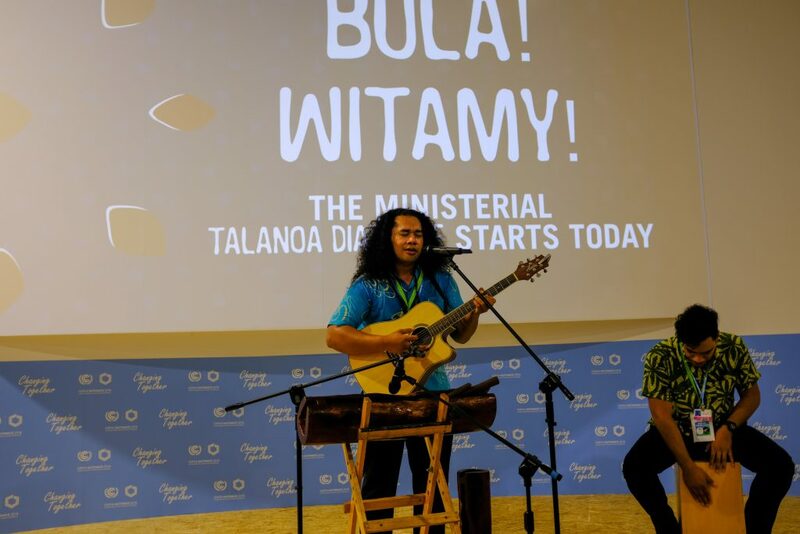 Fiji, for example, who presided las COP in Bonn, has a 100% renewable energy goal for 2050. This is impressive if we consider that Fiji is one country, 300 islands and thousands of challenges. Connection is key. But they are not backing down, as the country’s minister highlighted that “Fiji is committed; we are transforming”. And they are. What is one of the biggest challenges islands, and other countries as well, face? Investment. The issue here is not so much related to the lack of money, but it’s destination. According to the panel of the International Energy Agency, we would only need an 15% extra investment, but we would need to completely divert all the investment projects and turn investment to energy efficiency, renewables and storage technologies. It might not seem like a big deal that a small island commits to big goals if bigger countries do not. But the truth is that a lot of countries are committing. 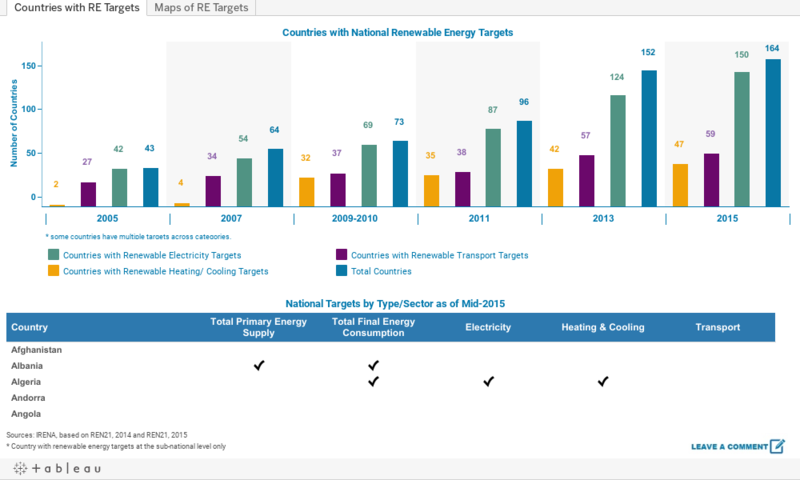 If not, check the amount of countries with renewable energy targets today. Affordability: electricity needs to remain cheap enough for people to purchase it. Security: there can be no blackouts. Sustainability: there can be no pollution. Click the image to see the report. At the heart of this trilema, is people. And this is the easiest thing to forget, especially when talking about fancy statistic that show how good we are doing in renewable deployment. If you see the trend of renewable energy installation, it is impressive. We are (partially) heading in the right direction. But if you see what is needed, if you scroll through the Emissions Gap Report, you are going to see a different picture. Here is where people are key, and their voices were heard through the aisles and stairs of the conference venue. Yes, there are good actions happening right now. But how long will it take? 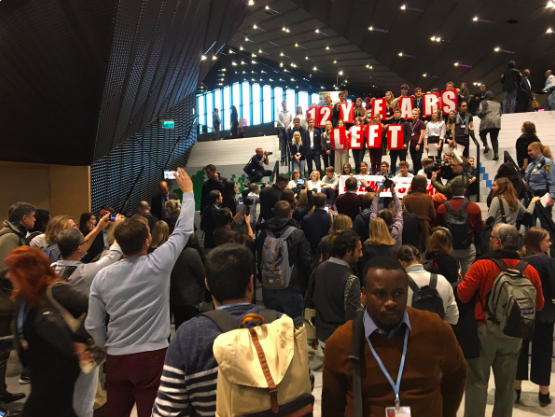 COP24 should stop being a hashtag and become something shameful. Guys, 24 years to come up with a plan? Who would celebrate something like that? 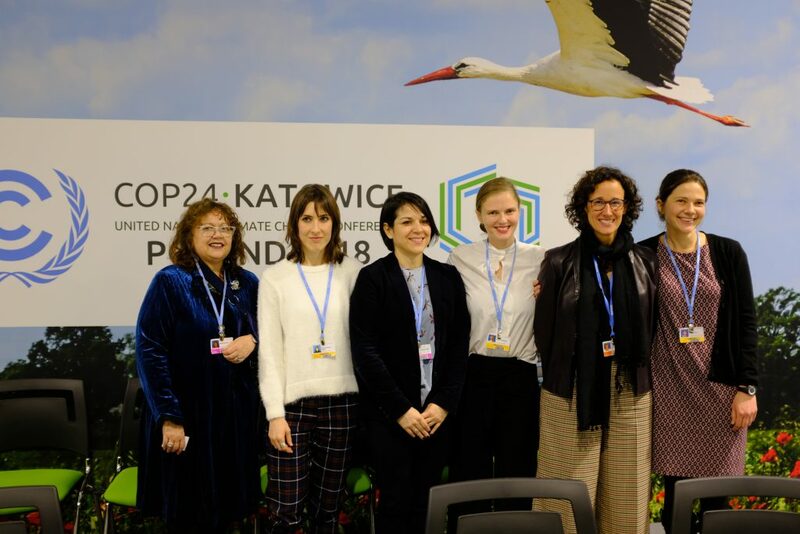 24 years to come up with a non-binding voluntary agreement (COP21) whose path we are starting to build (COP24). Congratulations for the good work. But, in 12 years, it will be too late. This despair is sincerely expressed by 15-year-old Swedish student. You can listen to her below. “We have not come here to beg world leaders to care. You have ignored us in the past and you will ignore us again. We have come here to let you know that change is coming, whether you like it or not. 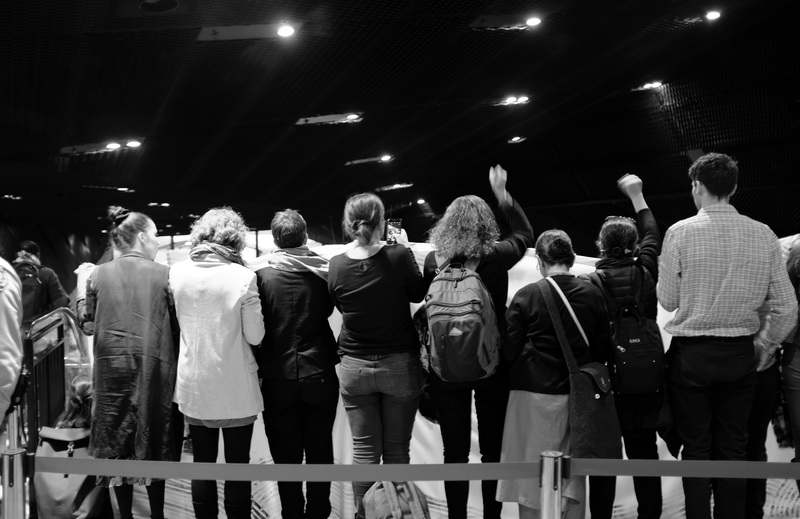 The real power belongs to the people” – Greta Thunberg at COP24 on Wednesday 12th. Once again, energy transitions are key. An extra 15% investment is needed. More importantly, we need to change the receivers of these investments. Energy transitions cannot forget people. Therefore, renewable energies need to be cheap, to be secure and clean (which they are). A lot of voices are needed when addressing climate change, because a lot of people are affected now, today. Including them today will bring a better tomorrow. Greta Thunberg came into my radar. One of my favorite things of the day was the (for my opinion) controversial “People’s seat”. The idea was to include people in the negotiations (which were per definition closed for the public, with the exception of the two days of Talanoa Dialogue). One the one hand, inclusion of people is always good. On the other one though, it needs to be more than just a hashtag. I also got to see the Argentinian Secretary of the Environment and Sustainable Development, the rabbi Sergio Bergman, give his speech in the plenary – speech that was supposed to last 3 minutes and lasted almost 10. Learn about policy diffusion of renewable energy targets with this video. The day went by relatively quick, and I attended to only one talk. After listening to so many people throughout the week, my priority became talking to them, specifically. I had approached a couple of persons the day before, and they had agreed to meet on Thursday. Fortunately, none of them cancelled – even considering that busy people have busy days at COP. 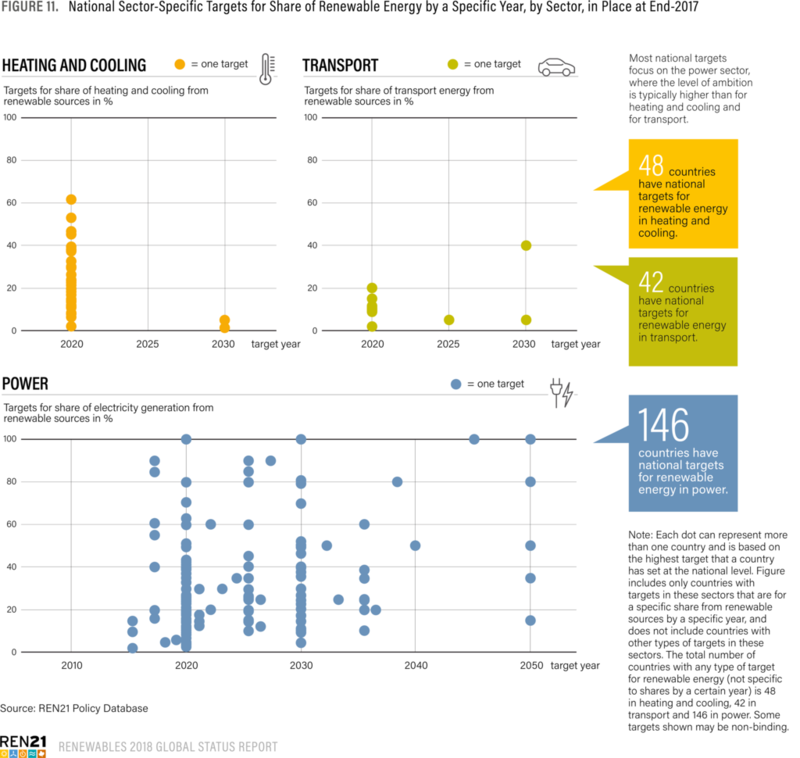 As my Master’s thesis I have been researching, for the past year, the diffusion of renewable energy targets. In 2005 there were only 43 countries with renewable energy targets, whereas in 2015 this number went up 164. I want to find out how did this happen. 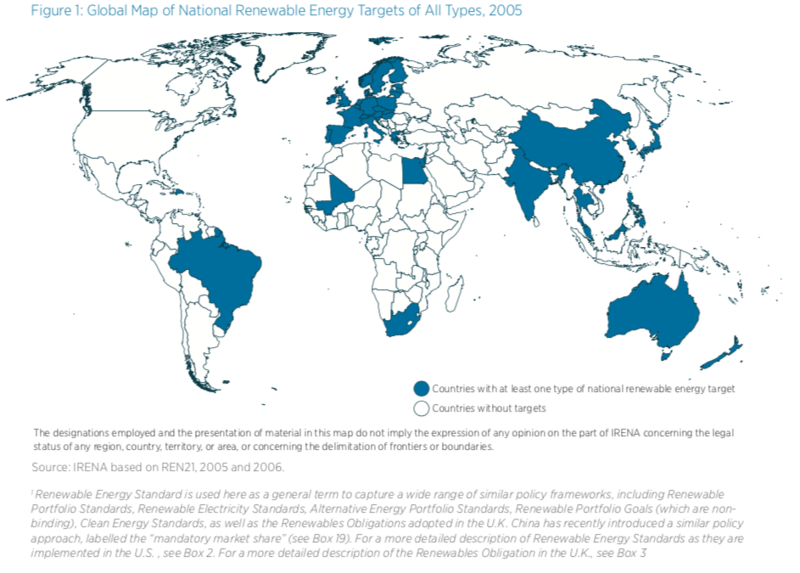 Renewable energy targets in 2005, from IRENA with data from REN21. 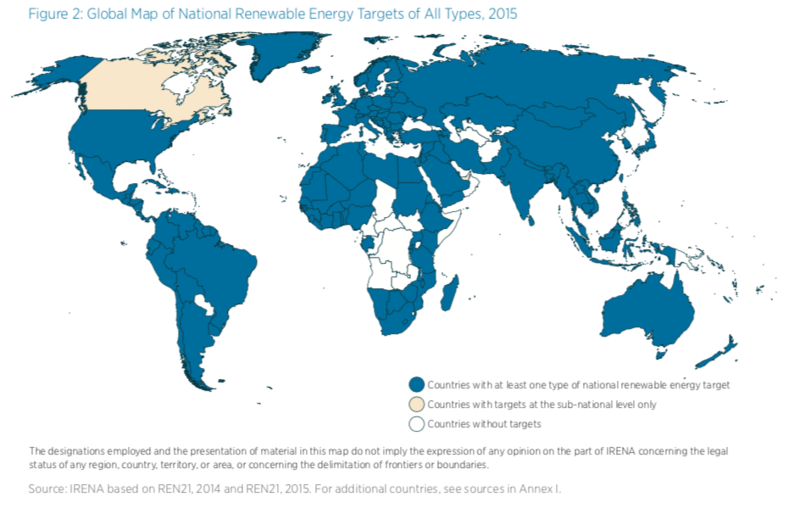 Renewable energy targets in 2015, from IRENA with data from REN21. In the pursue of leaving the Ivory Tower I had embarked myself on, I talked to people about my research, and heard from different characters what they had to tell me about renewable energy targets. You can learn a lot from reading – and you need to read. But there is something different about talking with people involved in the processes you are studying. People, the so-called “experts” can actually share their expertise. From Germany to a more international scenario, the message was clear: some countries started pursuing renewables as a way to phase out nuclear, and this development made it cheaper for the rest of the world to pursue renewable energies. Of course, first-movers benefited from this development as well. Today, it makes economic sense to install renewables, since a lot of times they are cheaper than fossil fuels. 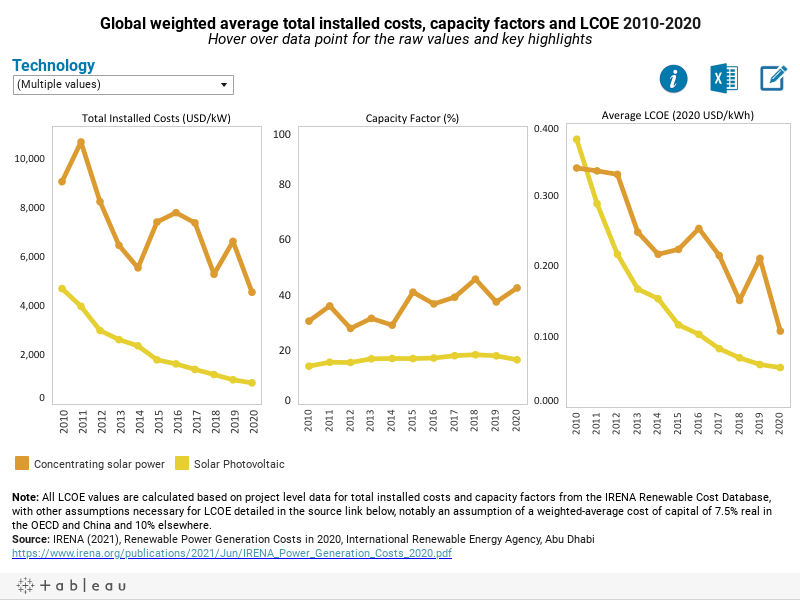 You can see a graph below showing the decrease in costs of different renewable energies. There are different reasons for why different countries adopted renewable energy targets, and it is important to identify and understand them. Today, renewable energy targets for the power sector are almost everywhere. However, in other sectors such as transportation and heating these targets are still relatively novel, although they are increasing as well. This was pointed out by Duncan Gibb, from REN21. Click image to see report. There are a lot of people working towards energy transitions. Although there is data available, not a lot is known about how these transitions happened. It is important to gain a better understanding of this. Talking to people involved in tracking energy transitions was very good. I had been carrying the tripod every single day, in case I got an interview. The one day I decided not to take it, I had one interview. And a unipod I became. We had a press conference with two people in the audience (both of our professors). I was able to hear Al Gore talk, which was pretty cool. 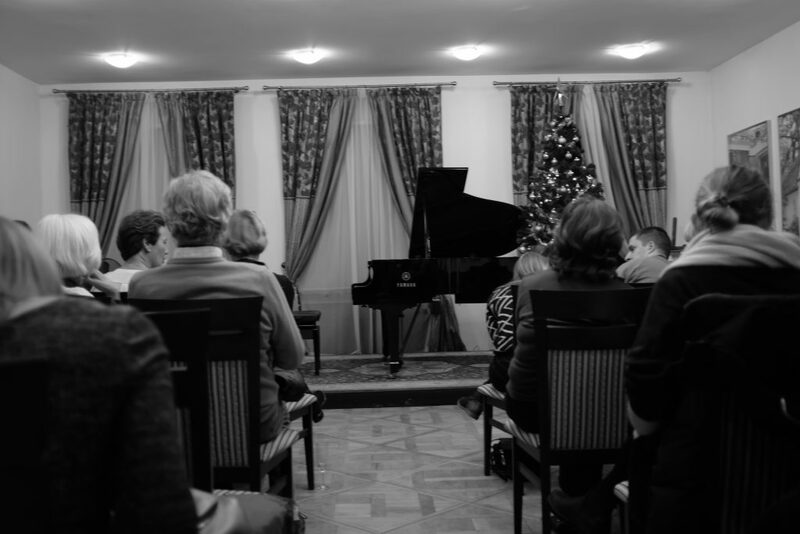 To close the day, we were able to go to a Chopin’s concert, who, as French as his name sounds, was Polish. It’s over. Last day waking up early. This day, the highlight was the plenary and the closing ceremony; but there was no initial agreement. There was no consensus. The plenary got postponed and postponed, until Saturday came. 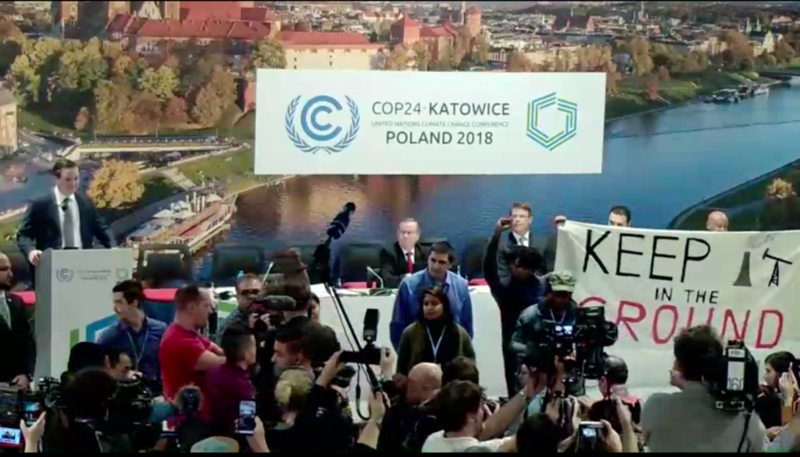 COP24 should not be a hashtag, it should be a shameful statement. Twenty four attempts, and we are still trying. It should instead be used to prize our perseverance. These meetings are very important, and therefore important outcomes emerge from them. But these outcomes do not come in an automatic form. The fact that we are meeting once a year does not directly mean that the climate crisis will be solved. Action needs to follow our words. Action needs to follow our written statements. It was in 1896 when we discovered that putting excessive amounts of carbon dioxide into the atmosphere was bad. This was not a typo, it was in 1896. 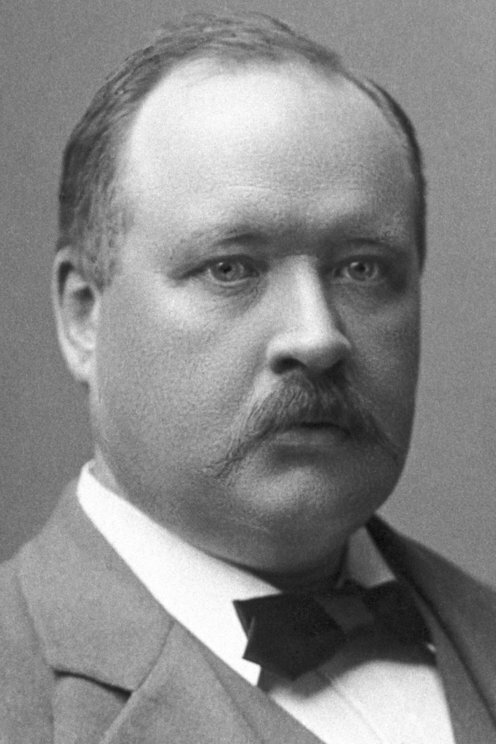 Using the data available at his time, the Swedish chemist Svante Arrhenius found how much heat was trapped by carbon dioxide and water vapor in our atmosphere. You can read more about Arrhenius here. His conclusions were that if we doubled the amount of CO2 we put in the atmosphere, the Earth’s temperature would increase by 4 to 5° C (he actually underestimated the temperature raise by 1° C ). He said this when CO2 concentrations were at 294.9 parts per million, which we know thanks to air bubbles trapped in ice core records (you can see how this is done in the video below). On November 16th, 2018, CO2 concentrations were 409.98 parts per million. How do we know this? Thanks to another guy some years later: Charles Keeling. Understand how CO2 is measured from ice core. Charles Keeling, more than half a century later, found enough evidence to show that the atmospheric concentrations of carbon dioxide followed seasonal oscillations (more CO2 in fall, less CO2 in spring), that they were steadily increasing throughout the years, and that this increase was notoriously produced by combustion of fossil fuels (oil, natural gas, and our -in-famous coal). Understand how CO2 is measured from air. Today, it is said that 97% of scientists agree that climate change is real, and that human impact in unequivocal. This statement is even included in the IPCC reports, whose words are carefully selected and voted. You can choose to believe it or not. What you cannot choose is that science is not a belief system, it is an evidence-based one. 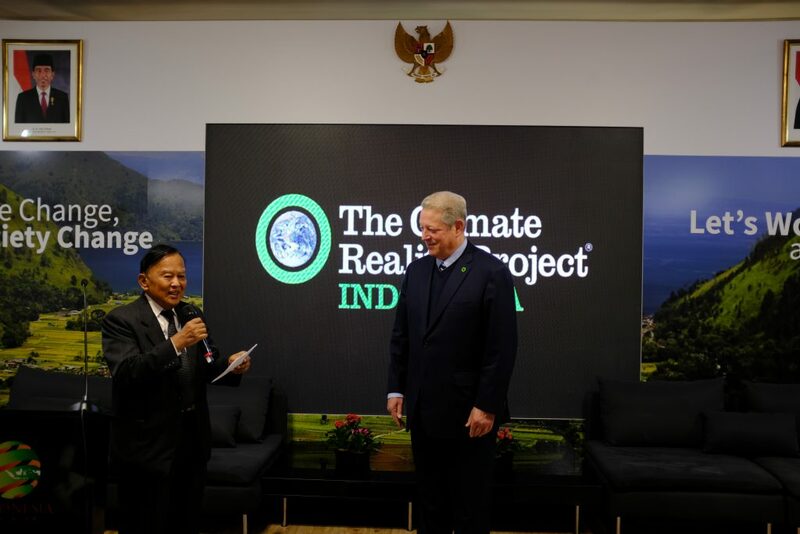 All of this science lead high-level officials to meet in 1992 and create the United Nations Framework Convention on Climate Change (UNFCCC for pragmatic reasons), which is COP’s mother, the Conference Of the Parties. Parties to what? Parties to the UNFCCC. The idea behind this 24-page document was for countries to meet every year and come up with a plan to reduce emissions in order to stabilize greenhouse gas (GHG) concentrations so that we do not interfere with the climate system, with what would “naturally” occur in Earth anyways. Twenty-four years later here we are. In 2015 representatives (tears and all) signed the Paris Agreement, or the “Paris Deal”, as some people mistakenly like to refer to. In this 32-page document countries “commit” to reduce GHGs in order to keep the average temperature increase well below 2° C. How? Through nationally determined contributions – goals that each country would set for themselves. But exactly how are we going to decrease emissions to keep the planet well below a 2° C average temperature increase ? That is what COP24 was all about. Or tried to be. 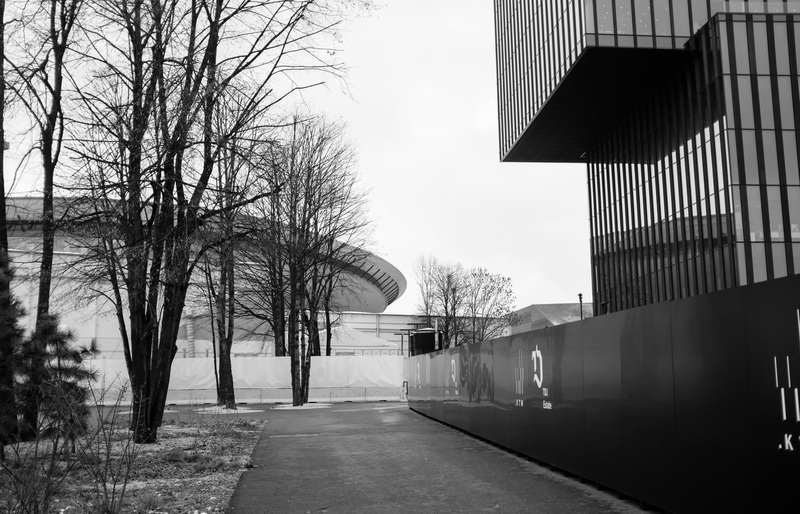 It was an honor to be part of one of the 21,606 guests that Katowice received for COP this year. But this needs to be more than an yearly meeting. We need to agree on what to do, and we have to do it. 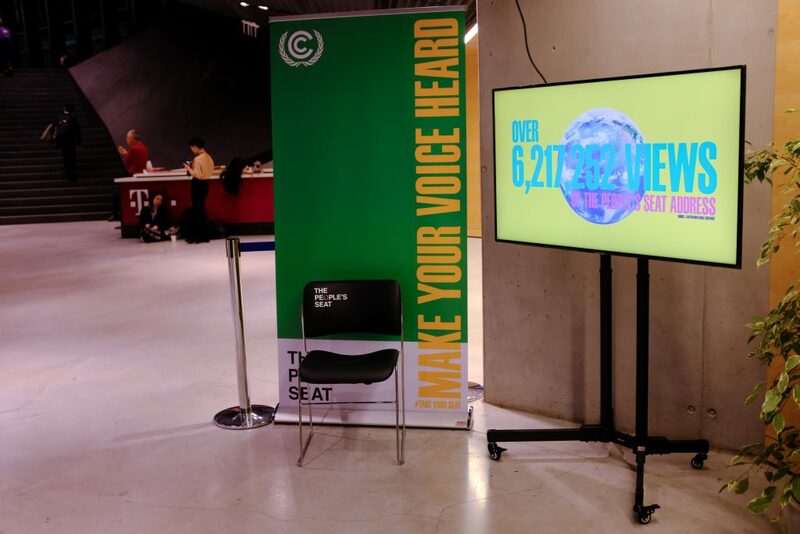 The Conference of the Parties, which takes place every single year since 1995, is a meeting where delegate from countries, NGOs, IGOs, reporters, and others meet to solve the “climate crisis”. Some meetings are more productive than others, given that all decisions are reached by consensus. That is, every single country has to agree to every single word and comma written in the documents being discussed. If four countries do not agree, there is no document signed. There is no democracy in the international level. Either all agree, or none does. Clearly, this delays the results that we need. But clearly, this is the best way we have found so far. Waiting, and waiting for the final plenary to happen reminded me that even the most important meetings get delayed (and delayed). 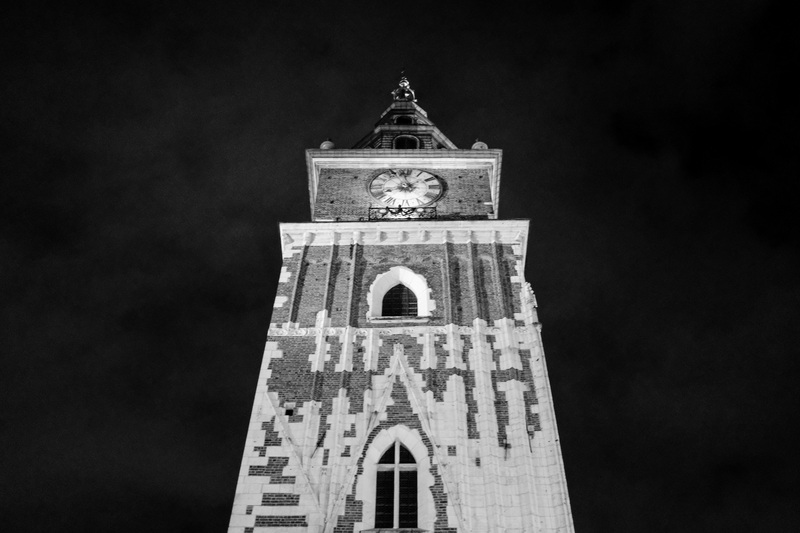 Saying goodbye to Katowice, the snowed fields, and Kraków.